1. Atomic orbitals of comparable energy and proper symmetry combine together to form molecular orbitals. 2. The movement of electrons in a molecular orbital is influenced by all the nuclei of combining atoms. (Molecular orbital is polycentric in nature). 3. 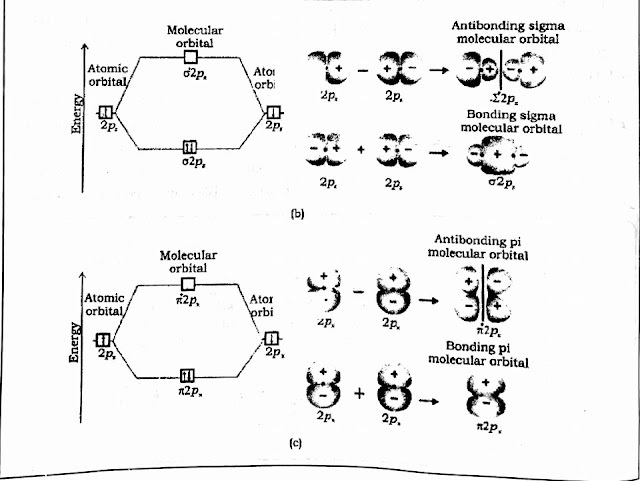 The number of molecular orbitals formed is equal to the number of combining atomic orbitals. 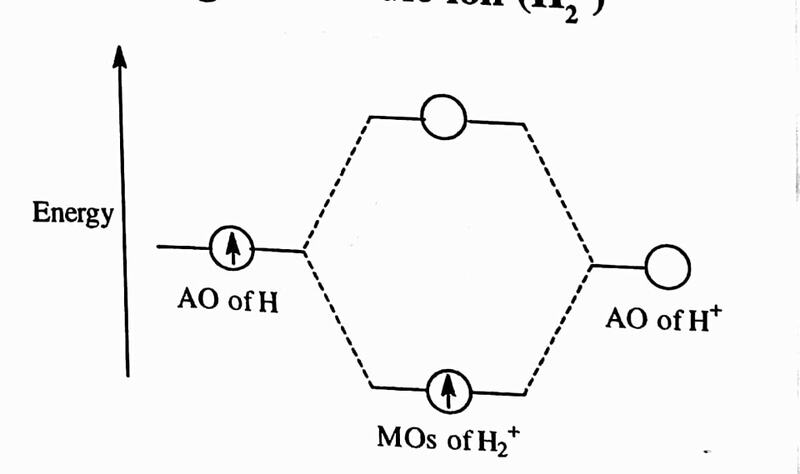 When two atomic orbitals (AO's) combine together two molecular orbitals (MO's) are formed. 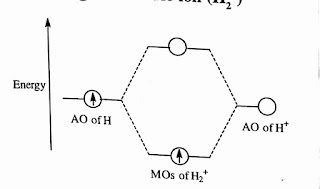 One molecular orbital possess higher energy than correspoing atomic orbitals and is called antibonding MO (ABMO) and the other has lower energy and is called bonding MO(BMO). 4. 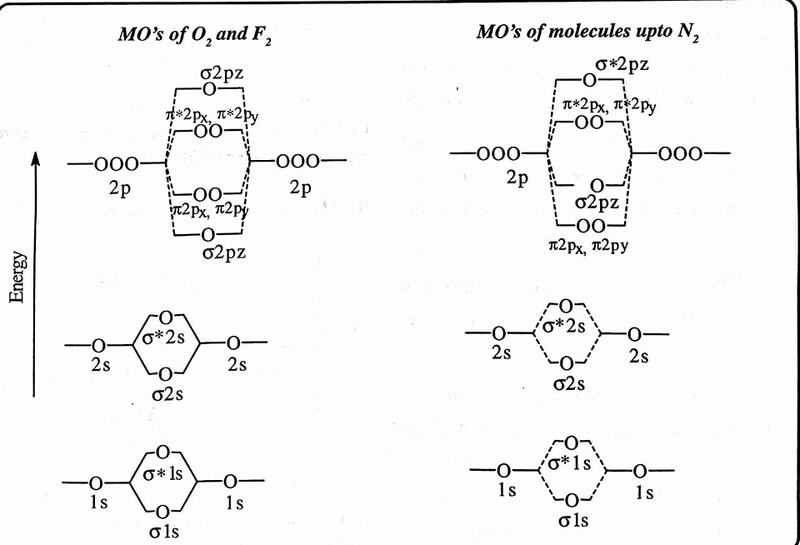 In molecules electrons are present in molecular orbitals. The electron filling is in accordance with Pauli's exclusion principle, Aufbau principle and Hund's rule. The formation of molecular orbitals can be understood in terms of constructive or destructive interference of electron waves of combining atoms. In the fo rmation of BMO, the two electron waves of the bonding atoms reinforce each other while in the formation of ABMO, the electron waves cancel each other. 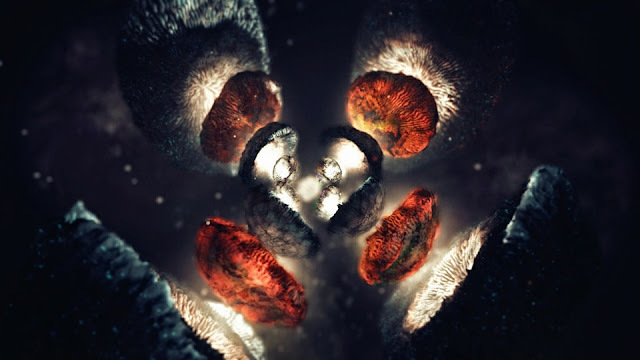 The result is that in a bonding molecular orbital most of the electron density is located between the nuclei of bonded atoms and hence the repulsion between the nuclei is very small. The electron density between the nuclei hold them together and stabilizesthe system. But in ABMO there is very low electron density between the nuclei and hence the repulsion between them is high, which destabilizes the system. chemical bonding. LCAO method (L inear Combination of Atomic Orbitals) is an effective approximation method to solve quantum mechanica1 problems (Schrodinger wave equation). Here ΨA + ΨB represents the bonding molecular orbitals while ΨA - ΨB represents the antibonding molecular orbital. ie, BM0 is formed by the addition of atomic orbitals while ABM0 results from subtraction of atomic orbitals. The molecular orbitals formed by the combination of 1s orbitals are called sigma ( σ ) orbitals. σ orbitals are symmetric about the molecular axis. The BMO is designated as σ and ABMO is designated as σ* (sigma star). In case of p-orbitals, pz orbitals combine to form σ molecular orbitals. The molecular orbitals of px and py are not symmetrical about the bond axis and they are termed as π (pi) MO's. The energy sequence of these molecular orbitals has been determined from spectroscopic data. 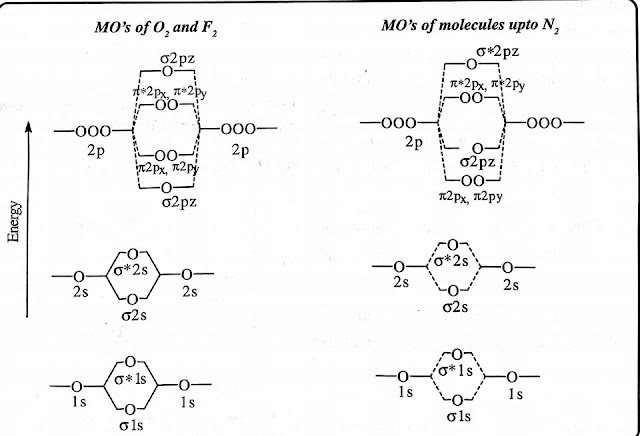 The increasing order of energies of various molecular orbitals for O2 and F2 is given below. 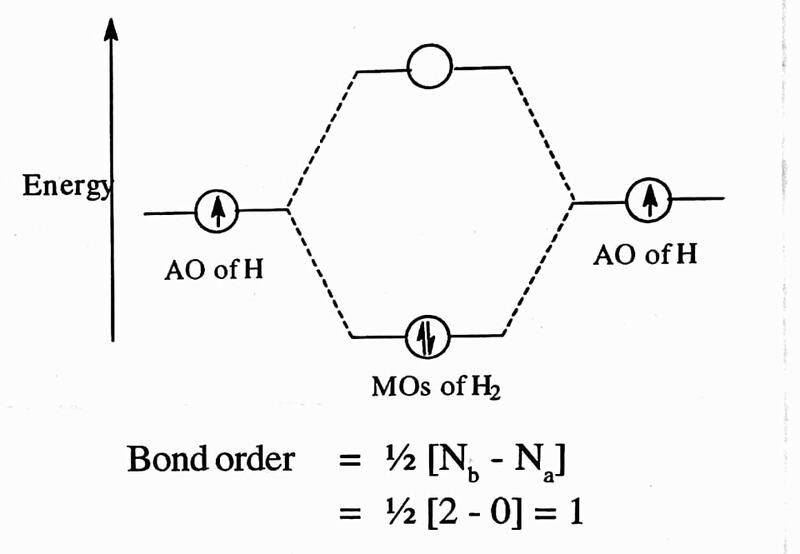 Bond order is defined as the half of the difference between the number of electrons present in the bonding and the antibonding molecular orbitals. Where Nb is the number of electrons in BMO and Na is the number of electrons in ABMO. to number of antibonding electrons no bond is formed]. The bond order is directly related to bond strength. This means that the higher the bond order, the larger is the bond dissociation energy of the molecule, ie the stronger is the bond. The bond order of a molecule is inversely proportional to the bond length. 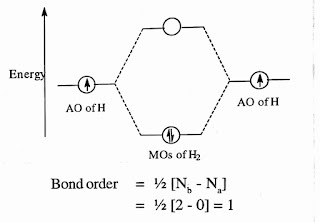 i.e the higher the bond order, the smaller is the bond length. The electronic configuration of a molecule helps to predict its magnetic character. If all the electrons in a molecule are paired, the substance is diamagnetic. If there are unpaired electrons in the molecular orbitals the molecule is para magnetic. H2 is formed by the combination of two hydrogen atoms. Each hydrogen atom has one electron in 1s orbital. The two electrons in H2 molecule are present in cr 1 s molecular orbital. So electronic configuration of H2 molecule is σ 1s2. In H2 molecule, H atoms are bonded together by a single bond. Due to the absence of unpaired electron H2 is diamagnetic in nature. This may be considered as the combination of a H atom and a H+ ion. H2 + has only one electron, which occupies the σ1s orbital. :. H2 + is stable and exists; it is paramagnetic in nature. He2 molecule is unstable and does not exist.